Las Vegas has always been known for iconic hotels. A few decades ago, resorts such as the Luxor and the MGM Grand were among the first to thrill visitors, and more recent additions such as the Bellagio and Venetian have continued in that same tradition. 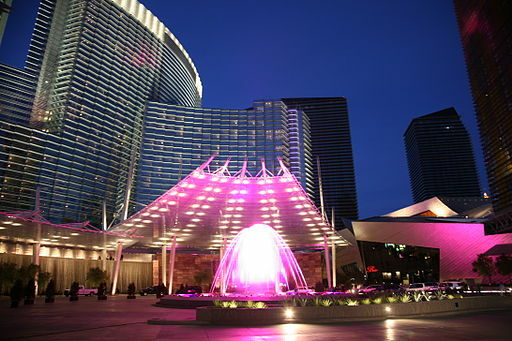 However, it appears that Las Vegas may have outdone itself with its latest addition to the Las Vegas Strip � the ARIA Casino. Of course, when you stay at the resort, you may be impressed by its environmental credentials, but what you really care about are the amenities that it has to offer � and you won’t be disappointed. The luxury starts as soon as you walk into the three-story lobby. This continues the overall environmental theme of the hotel, with a design that includes natural materials such as flowers, foliage, wood and stone. There is also a water feature called ‘Lumia’ situated at the entrance to the hotel, which synchronizes bursts of water with the rhythms of music. Silver River, an 87-foot-long silver sculpture of the Colorado River, hangs behind the reception desks � this was created by Maya Lin, designer of the Vietnam Veterans Memorial in Washington, DC. If you are looking for extraordinary dining, look no further than Julian Serrano, the eponymous tapas restaurant located in the lobby of the ARIA � Esquire Magazine named this one of the 20 best new restaurants in America in 2010. There are also a number of other excellent restaurants run by celebrity chefs. This includes bar MASA, a modern Japanese restaurant created by Masa Takayama, owner of the Michelin three-star Masa in New York City. There is also the American Fish run by Michelin-starred chef Michael Mina, and the Jean-Georges Steakhouse, run by noted chef, restaurateur and author Jean-Georges Vongerichten. Another must-see attraction at the hotel is Cirque du Soleil’s Zarkana, the newest and perhaps most innovative show on the strip. It tells the story of a ringmaster named Zark, who brings the inhabitants of a deserted theater back to life one by one. Each in turn becomes an acrobatic performer, slowly populating the stage until it reaches a crescendo of graceful and athletic activity.